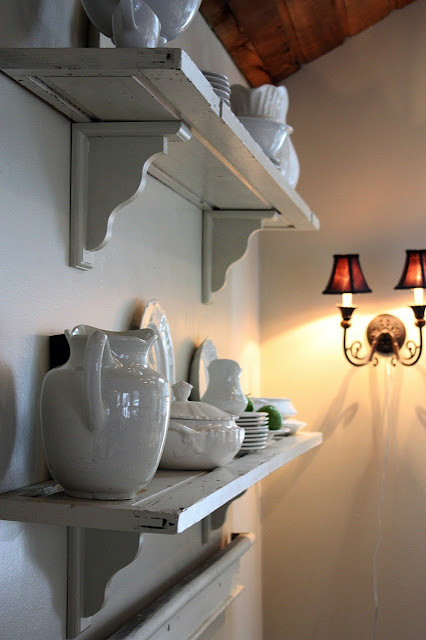 I wanted to give my dining room shelving a fresh clean look. 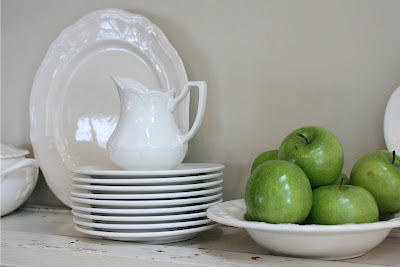 So, I opted for white dishes and a bit of green and black to keep it from looking too stark. 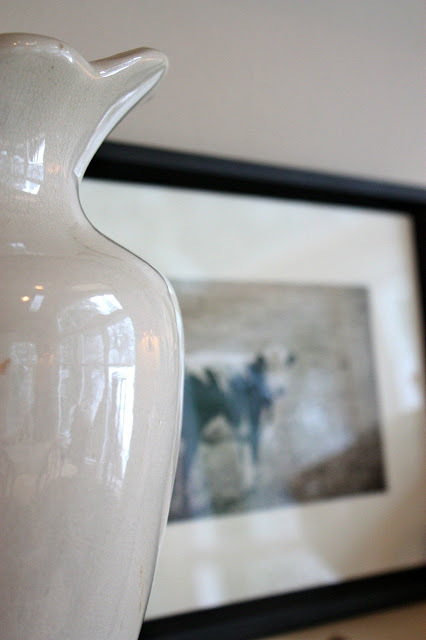 I added a simple photograph of a cow in a black frame with a white matte. 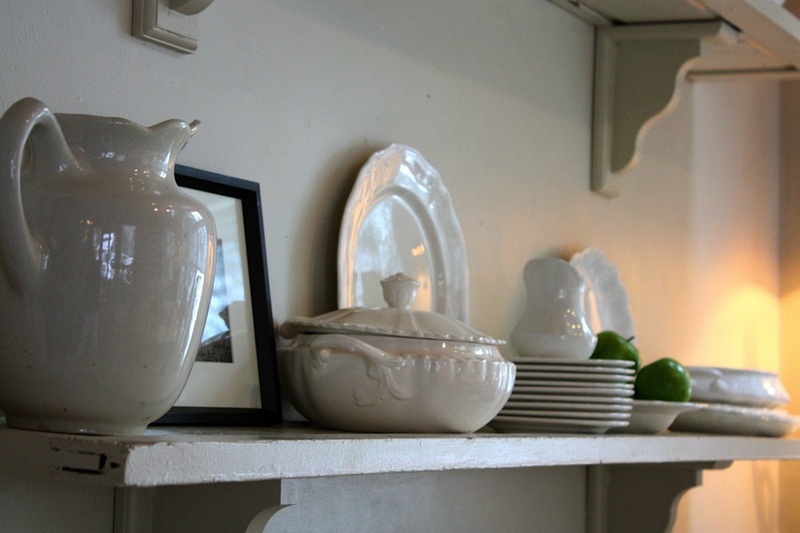 The dishes are a mix of old and new. 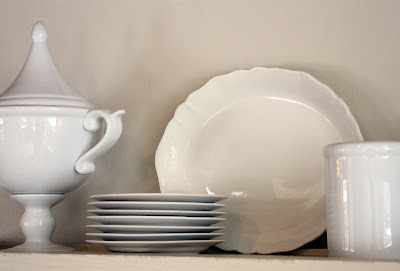 I have a lot of vintage white ironstone I have displayed, but it is also mixed in with dollar store plates and pottery barn white dishes. The apples seem to liven things up a bit, and you know I love the color green! If you are new to my blog, you might be interested to know that I made these shelves out of ripping an old door in half on a table saw. I simply attached them to brackets I bought at Home Depot, and painted them same color as the wall. I mixed cream and white. I really think it's OK to do this, it adds interest and everyone knows there are many shades of white. I still may hang a plate or two. 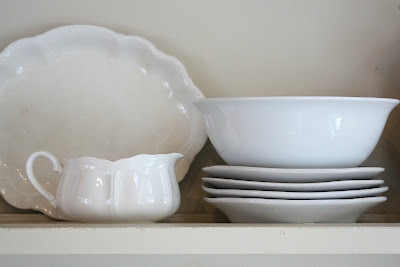 My favorite dishes are the ones with the scalloped or ruffly edges. I think come Valentines day it would be fun to throw a few pink flowers in here. love the fresh clean white look. 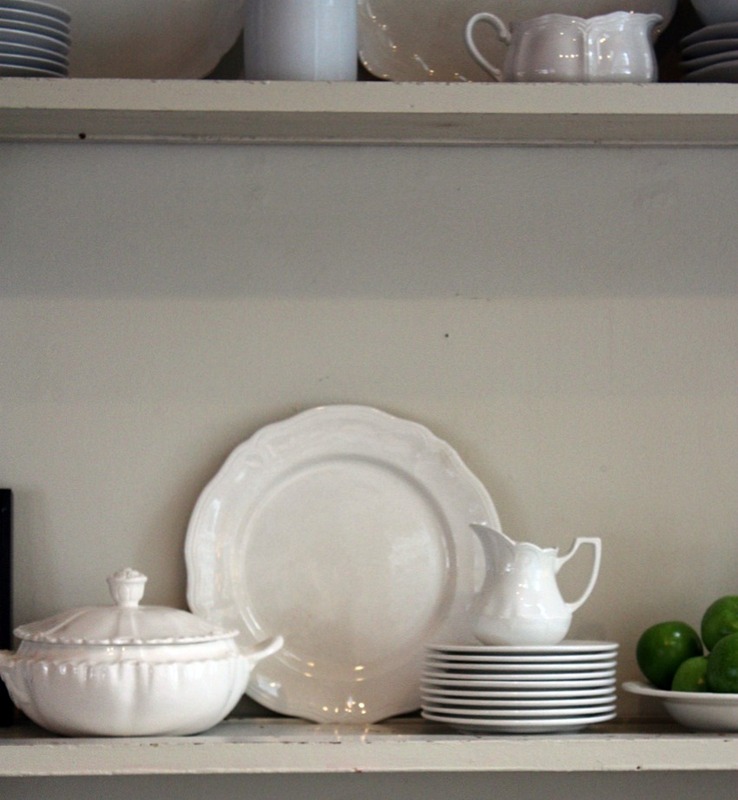 Your shelves look beautiful lined with your dishes. I also love the mixed shades of white and old and new is good. 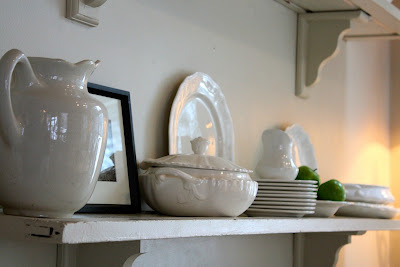 I'm starting to collect white stoneware and filling up my bookcases. 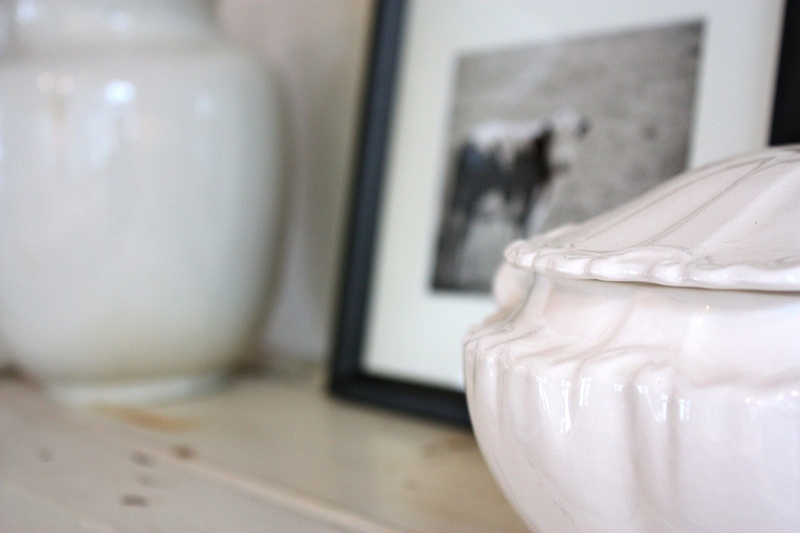 I'm with you, I love mixing the white and creams together and the old and new. Very pretty. 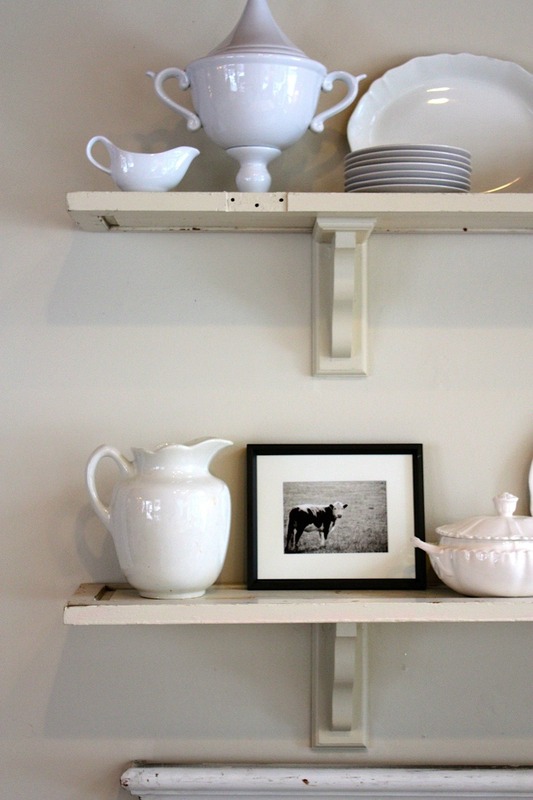 Love those shelves you made also. 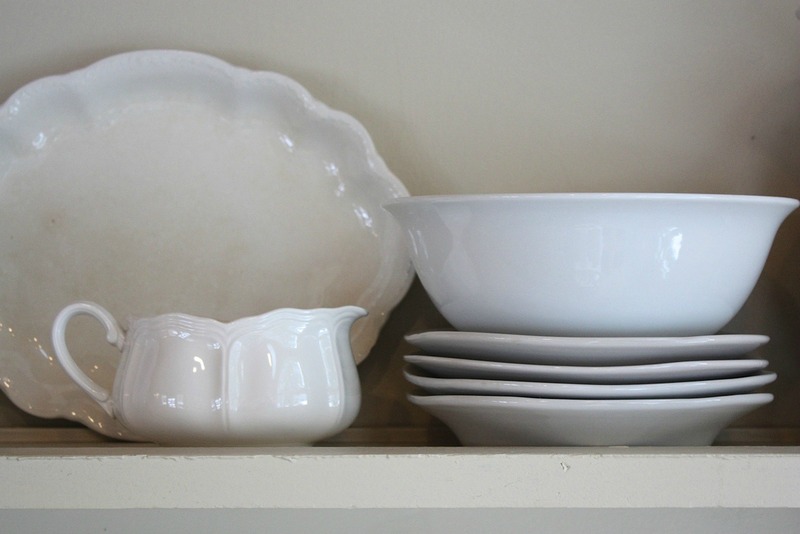 White was the only color dishes we could afford when we were first married. Along the years I've stuck with white and added the "older white" (cream). I just think all foods look delicious on a white background. Love the open shelving! 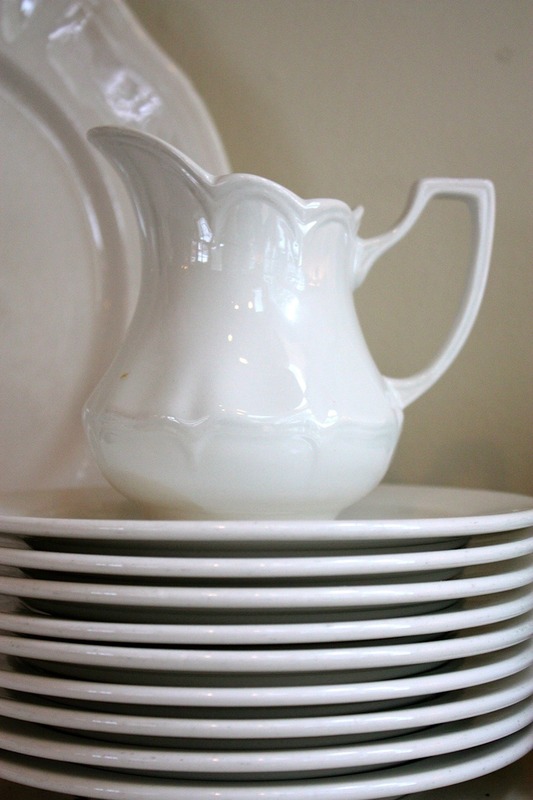 Your white dishes just sparkle!! Love the mix of old and new! 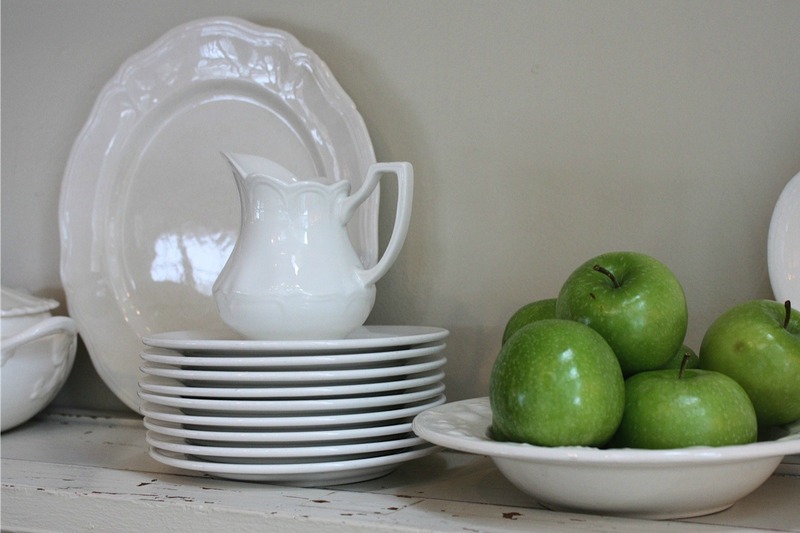 who doesn't love white dishes and ironstone. 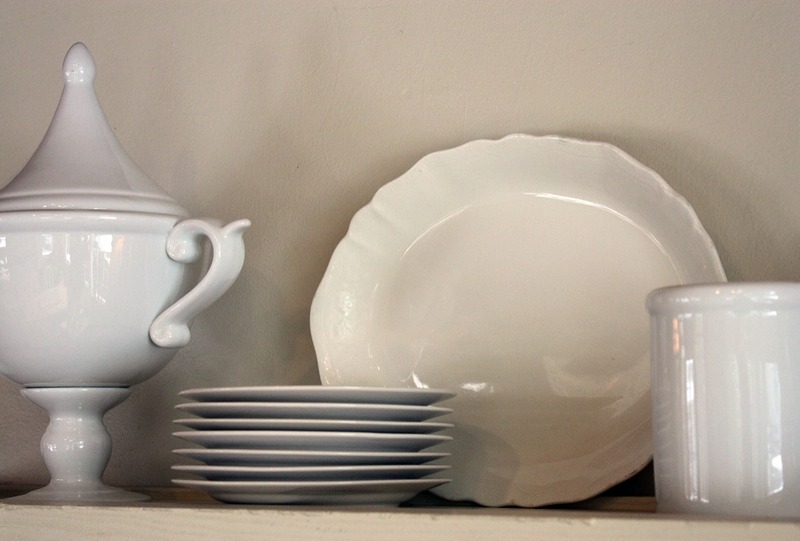 I love all your white dishes! I have a few that were my Mom's, but I am always on the lookout for more, I love them stacked on the shelf. I love the way this looks! The combination of textures is just soothing and interesting at the same time! Love it! I love white dishes too. You were clever to have made the shelving for them. When I saw your blog name, I had to visit. I was in Savannah last year for a few days and absolutely adored that beautiful city! I've done the same thing this winter...as soon as I took down Christmas, I kind of cleaned everything up....most of my spaces look a little bare. well, bare for me...I'd hardly say it's minimal since I like "stuff." Beautiful! I love your collection of white! I'm currently growing my collection. Such a classic look. 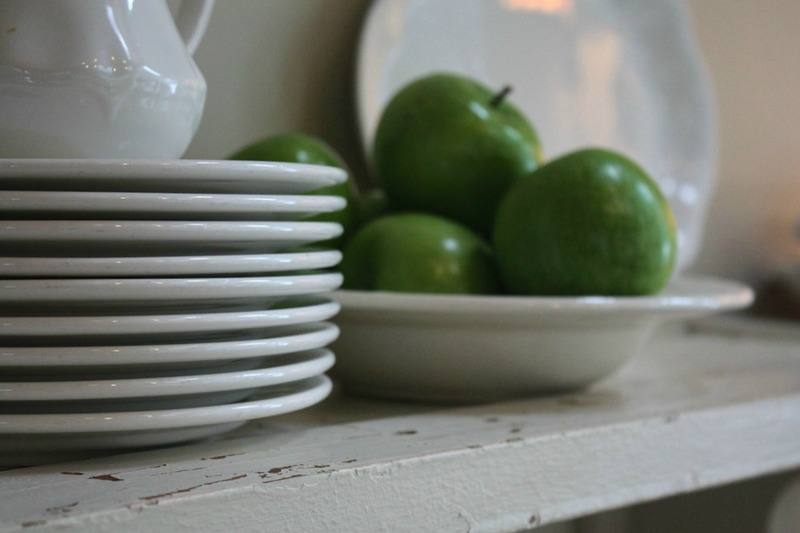 Love the white dishes! Beautiful!! Love your shelves! And I love the mix of cream & white! Thanks for sharing. Beautiful!! My lust for white ironstone continues... Thanks for sharing. You know what's so funny, just the other day I was looking through your back blogs, because I remembered those shelves you had in your kitchen, and Im thinking about doing something similar in my living room.... I had the computer screan almost up to my face.. and I thought to myself.... those shelves look like pieces of an old door. So funny you mentioned it in this blog. So cute, as always!! You've inspired me to get out my white dishes :). Do you have a blog on the door shelves? Those are so cute and so thrifty! !